In Roman law you were what you wore. This legal principle became highly significant because, beginning in the first century A.D., a "new" kind of woman emerged across the Roman empire, 'a woman whose provocative dress and sometimes promiscuous lifestyle contrasted starkly with the decorum of the traditional married woman. What a woman chose to wear came to identify her as either "new" or "modest." Augustus legislated against the "new" woman. Philosophical schools encouraged their followers to avoid embracing her way of life. And, as this fascinating book demonstrates for the first time, the presence of the "new" woman was also felt in the early church, where Christian wives and widows were exhorted to emulate neither her dress code nor her conduct. Using his extensive knowledge both of the Graeco-Roman world and of the New Testament writings, Bruce Winter shows how changing social mores among women impacted the Pauline communities. This helps to explain the controversial texts on marriage veils in 1 Corinthians, instructions in 1 Timothy regarding dress code and the activities of young widows, and exhortations in Titus for older women to call new wives "back to their senses" regarding their marriage and family responsibilities. 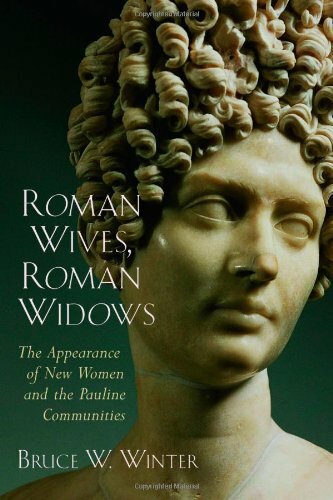 Based on a close investigation of neglected literary and archaeological evidence, Roman Wives, Roman Widows makes groundbreaking contributions to our understanding of first-century women, including their participation in public life as lawyers, magistrates, and political figures, which in turn affected women's ministry in the Pauline communities.